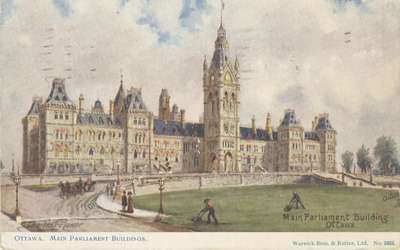 A postcard of the Main Parliament Buildings in Ottawa, which burnt down in 1916, sent to Rev. R.B. Layton in New Aberdeen, Cape Breton, mailed in Montreal. Leave tonight on S.S. Gaconna Capt. Holmes. Shall arrive in Sydney about Monday. Rec'd from Antigonish this am ... (subsequent text unreadable)"